Heartland Symphony Orchestra, Concertmaster Leslie Zander, is the featured soloist at their fall concert titled “Celebration” on Saturday, October 8, 2016 at the Little Falls Community High School, Charles D. Martin Auditorium, Little Falls, at 7:30 pm and on Sunday, October 9, 2016 at Tornstrom Auditorium in Brainerd, MN, at 2:30 pm. Zander will perform violin to Ludwig van Beethoven’s: Romance for Violin and Orchestra No. 2 in F major, Op. 50. Characterized as a work of gentle purity and delicate lyricism, the violin begins the piece by playing the main melody above a simple orchestral accompaniment. As the orchestra takes over with a fuller version of the melody the music is interspersed with moments of loud intensity, creating a sense of satisfaction when the gentle music finally returns. Throughout the piece, the violin engages in thoughtful dialogue with the orchestra, trading ideas back and forth as if having a conversation. The work ends as simply as it began, bringing the Romance into a full circle. Zander started teaching middle school level orchestra in the Brainerd Public Schools in 2000. In addition to directing the 6th-8th grade Orchestra and an extracurricular chamber orchestra, she teaches 5th grade Classroom Music at Forestview middle School. She also maintains a private studio of violin, viola, and cello students, ages 5-adult. Zander performs extensively throughout the Brainer Lakes Area both with the Trillium String Trio and as concertmaster of HSO. She has appeared with the Great River Strings Ensemble, the Legacy Chorale, and the Summer Festival in Mammoth lakes, CA, the Lake Chelan Bach Fest in Chelan, WA, and the previous five seasons of the Lakes Area Music Festival. 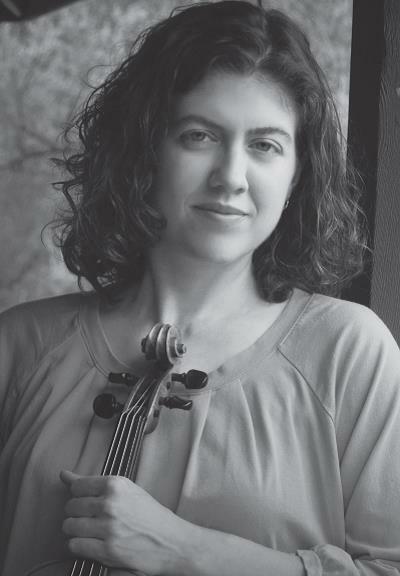 Zander began her violin lessons at age three at the Aber Suzuki Center at the University of Wisconsin-Stevens Point, where her teacher was Patricia D’Ercole. She studied with Mark Bjork at the University of Minnesota – Twin Cities, earning a Bachelor of Music in Instrumental and Classroom Music. The Heartland Symphony Orchestra is a 50-piece volunteer, nonprofit, community orchestra, and continues to serve the central Minnesota area of Brainerd, Little Falls, and the surrounding rural communities. Musicians, from amateurs to professionals, come together once a week from all over the region to rehearse and perform three full-length orchestral music concerts each season in both Little Falls and Brainerd. Special guest artists and conductors, local soloists and ensembles, area youth concerto winners, and charming repertoire commentary all help to make each concert unique and entertaining. The HSO also contributes its service to communities through music education programs, special events, and ticket giveaways. For more information about upcoming concerts or to get involved either as a player or HSO sponsor, please email HeartlandSymphony@gmail.com or call the HSO at 1-800-826-1997.